I have been slowly working on a stack of UFO’s that need to be quilted. This weekend’s finish was this Easter table runner. The pattern is a Terry Atkinson design called, Fast Food. The pattern is very simple–making use of a stripe that does all the work. This table topper has been sitting for at least 2 years waiting for me to have the opportunity to quilt it. The Quilt Show was broadcasting their shows for free this weekend. So while Ricky and Alex talked; I quilted. This is a close up of the fabrics and the quilting. 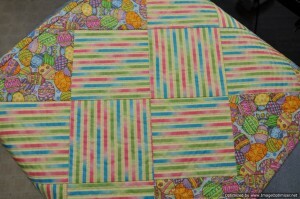 I quilted in the ditch around the blocks and then went up and down each yellow stripe. I love the dense quilting! 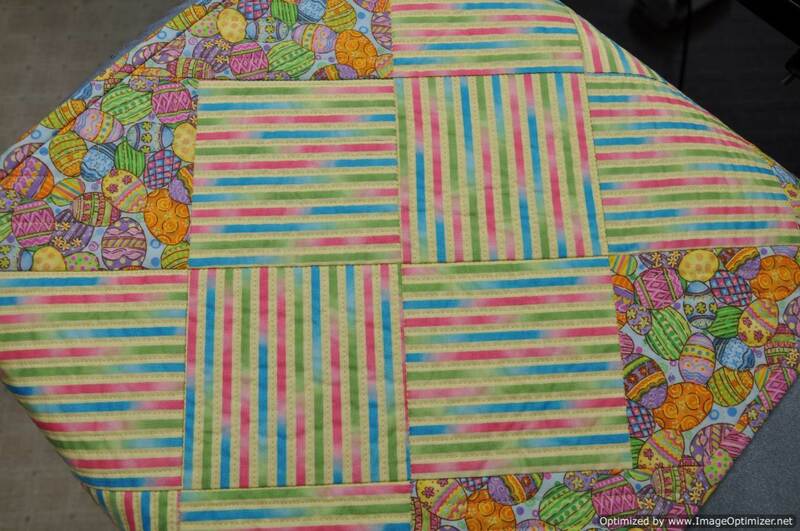 This entry was posted in atkinson, finished quilt, table runner by Norma Hanson. Bookmark the permalink.